A very good morning to you fellow traders and investors in the US stock market. Last week we continue to form a bullish pattern in the US stock market. There were not much weakness despite some sideways movement in the market. It is important for us to note that the US stock market is still in a weekly uptrend. It is also still in a daily uptrend. Therefore an investor in the US stock market should continue to remain bullish on the US stock market until the trend changes. I will do the analysis of the US stock market for this week on this page. I will also update it everyday so do come back to this page and press the refresh button tomorrow to get the latest updates. I think we really have gone a long way since early 2019. We had an extremely impressive rally back up and now we are almost near the all time highs Dow set last year. The Dow Jones is still in a weekly uptrend. So far I do not see any weaknesses yet. Therefore one should continue to follow the trend and be bullish on the US stock market. There is a possibility that the Dow might even make a new all time highs. After some choppy trading last week, the Dow managed to close near its open and therefore it formed a weekly bottoming tail. The presence of this weekly bottoming tail in the Dow tells us that the stock market is rejecting to go lower at the moment. If Dow can trade above the highs of this bottoming tail, we can expect further rises in the Dow. On the other hand a trade below the lows of the bottoming tail will show weakness in Dow and send it lower. The bottoming tail is useful to tell us that the market still wants to go higher. 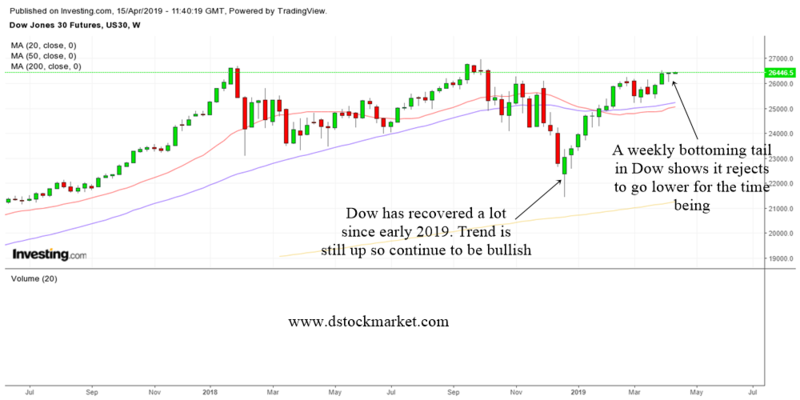 Compared to a topping tail in the weekly chart which we can see slightly after Dow made a new all time high last year, this bottoming tail last week gives bulls some good news. 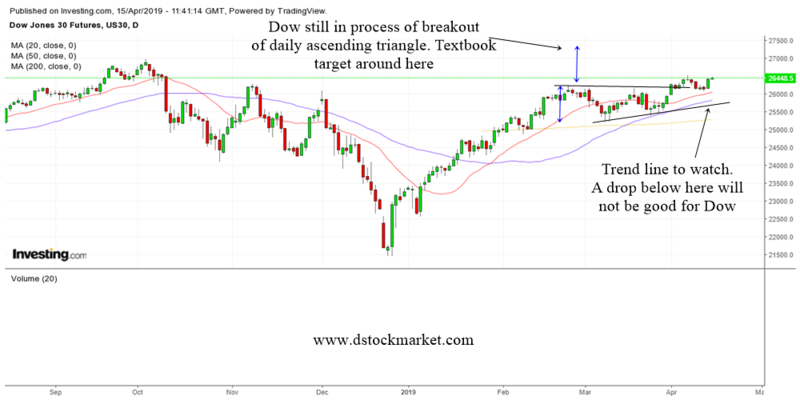 I have highlighted in the past analysis how Dow was forming a daily ascending triangle. It broke out of the pattern and is still in the process of going up to the target. The textbook target for the daily ascending triangle will be north of 27000. I do not know whether that will be achieved but if we follow the trend, yes it is quite likely that Dow can reach that area. The Dow Jones is also still above the daily 20 MA (red line) and the 50 MA ( blue line). That is a picture of bullishness and as long as Dow remains above these 2 moving averages we can expect bullishness. Last week Dow declined a bit but it found support at the top of the ascending triangle pattern. It reverse and move higher. Do take note of the lower trend line in the daily ascending triangle. If the Dow is any healthy it should not drop below that rising trendline. If it drops below it, take note as it shows weaknesses in the Dow and will likely send it lower. SPY is still in a 60 min uptrend. Note how it traded sideways last week but it did not really drop below the 60 min 50 MA. On the last trading day last week, SPY gap up and traded sideways. 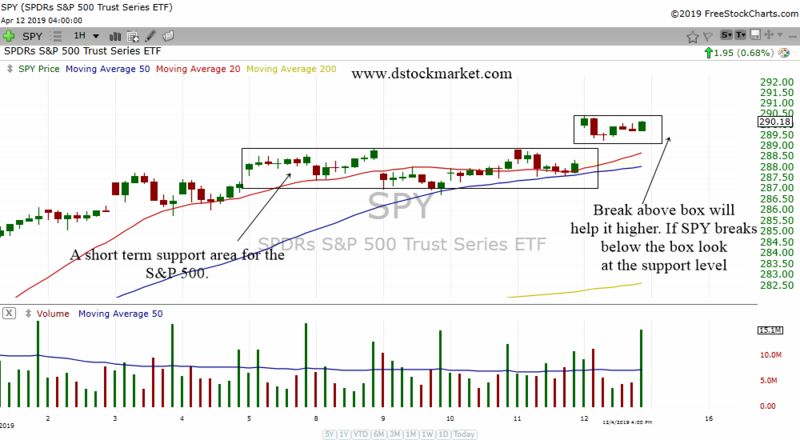 We can draw 2 boxes on the 60 min chart of SPY. One is the smaller box which was formed on Friday. It is a very short term analyzing tool for us. If SPY can break above the box today, then it is likely to go higher. On the other hand, if SPY drops below the box we can expect it to fall to the top of the larger box. The larger box will be the area to look out for. As long as SPY stays above the box, we can deem the short term trend to be healthy and the stock market to continue rising. Have a great trading week and hope this analysis helps you!